Emmanuel Macron has been president for one year, and May 2018 is also the fiftieth anniversary of May 1968. In order to say "enough is enough" an anti-Macron carnival demo was called in Paris on the 5th May. It was launched by an MP from the radical Left "France Insoumise" group (France in Revolt). 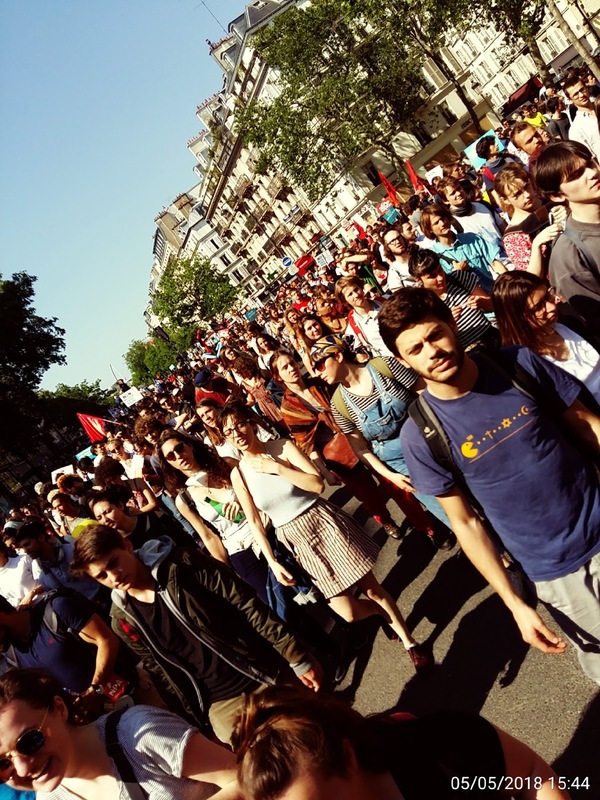 It was young and dynamic, was a great success and bodes well for the acceleration of a protest movement which has already seen fourteen days of train strikes, airline strikes, supermarket strikes, occupied universities and many other signs of revolt. 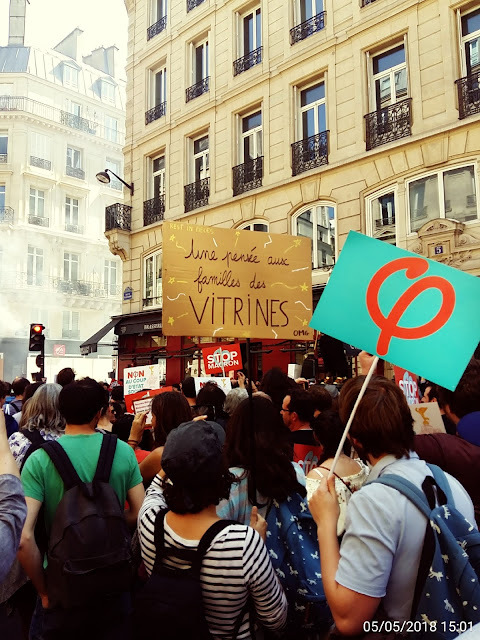 Photos and notes here are to help explain what the movement is and where it might be going to anticapitalists who do not live in France. 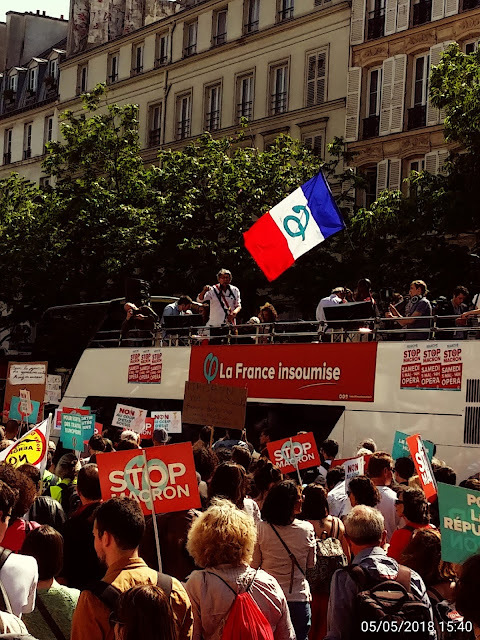 Here one of the France Insoumise MPs is speaking from the top of the FI bus as the demo goes on. The tricolour sash is worn traditionally by elected councillors and MPs. The French flag is decorated with the Greek letter Phi, symbol of the France Insoumise. 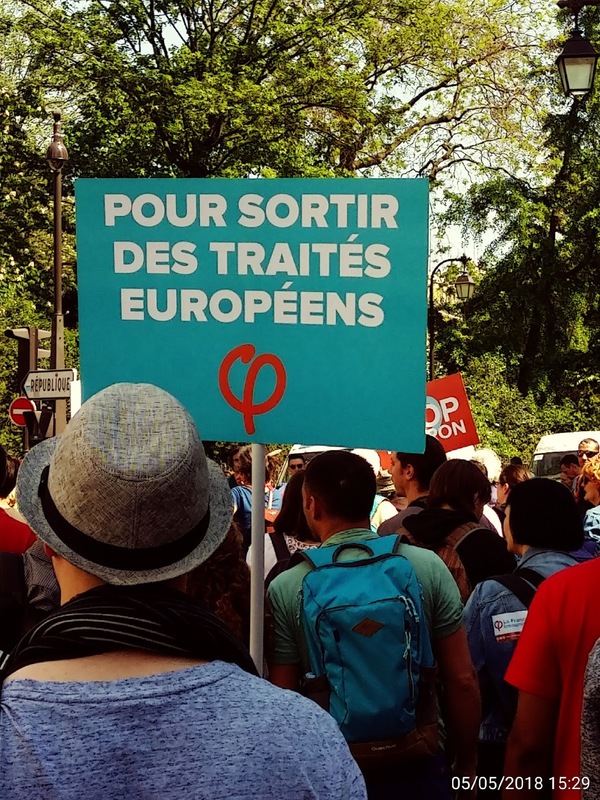 Two things to note about symbols here: first the FI chose the phi symbol because it did not have a political history, in order to emphasise the newness of their movement (in a style similar to Podemos in Spain). Secondly, the use of the French flag is because a good section of the leadership consider that the tricolour can be recovered for the radical left, emphasising its insurrectionary history back in the days of the French revolution (I have plenty of arguments against its use, but that debate is for another day). On the demo as a whole a very small number of people carried tricolour flags. 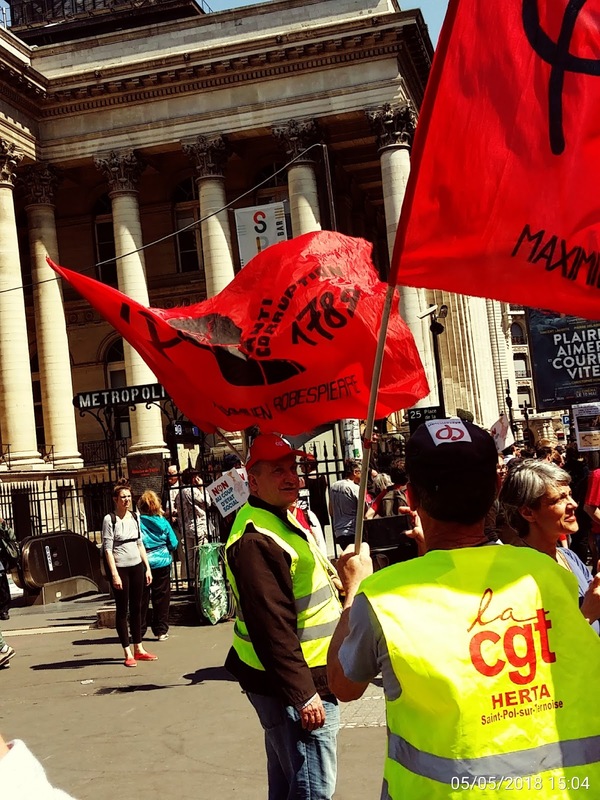 These CGT union demonstrators also wanted to look back to the French Revolution, with these red flags in honour of Robespierre. There were people of all ages on the demonstration, but in particular lots of young people, mostly not behind any particular banner. This dynamic section is of students from Tolbiac university. 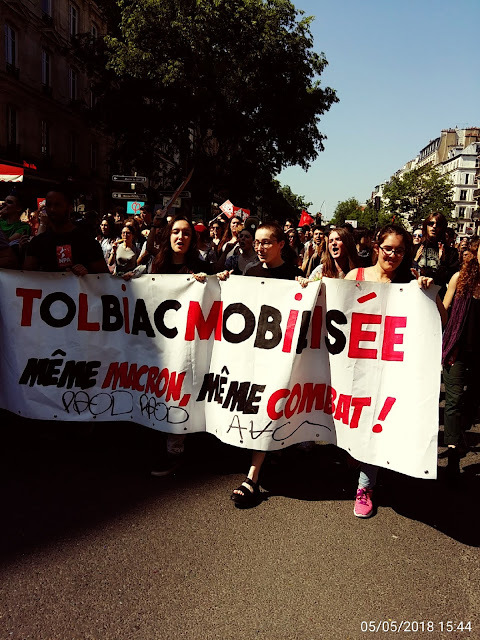 They occupied their university for weeks, and replaced classes with teach-ins on radical movements and ideas, before the University authorities asked for the riot police to be sent in, and the occupation was cleared just before dawn one day last week. Several other universities are still occupied, and some very radical tactics unseen for decades have been seen, now exam season is upon us. 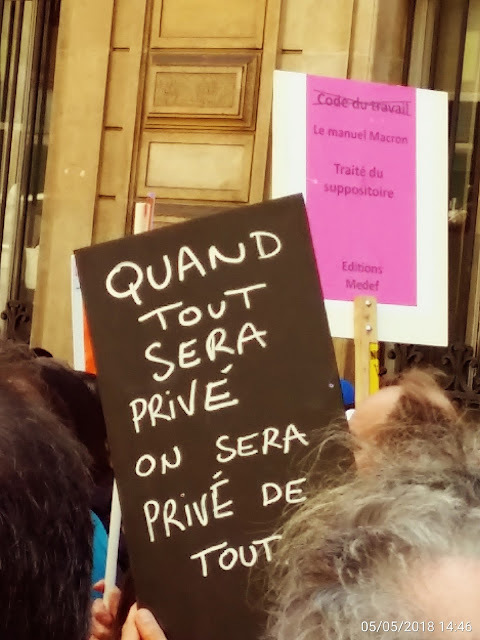 At a university in Paris, some students went on "exam strike" and handed in blank exam scripts with a political slogan on them. In a couple of universities, lecturers pledged to give every student the same high mark, since classes have not taken place for weeks. It is unclear at the moment if the student movement is still on the up and up, but it is still very lively. This is the contingent from the anticapitalist organization of which I am a member. 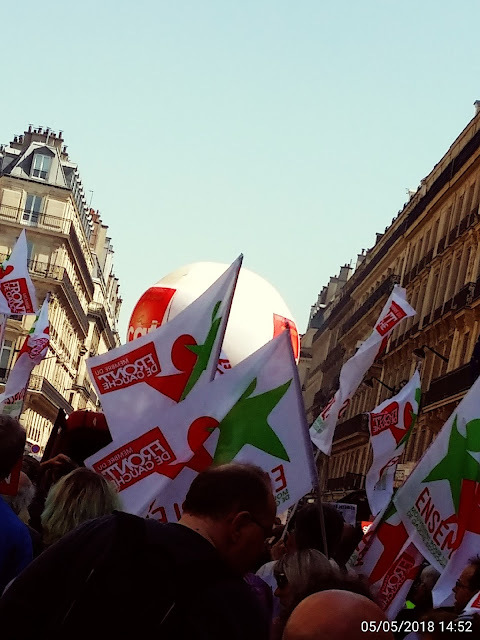 The demonstration was called by the France Insoumise MP, but other organizations were welcome and mobilized for it. Nevertheless, the demonstration showed the uncontested hegemony of the France Insoumise as the actual left opposition to Macron. 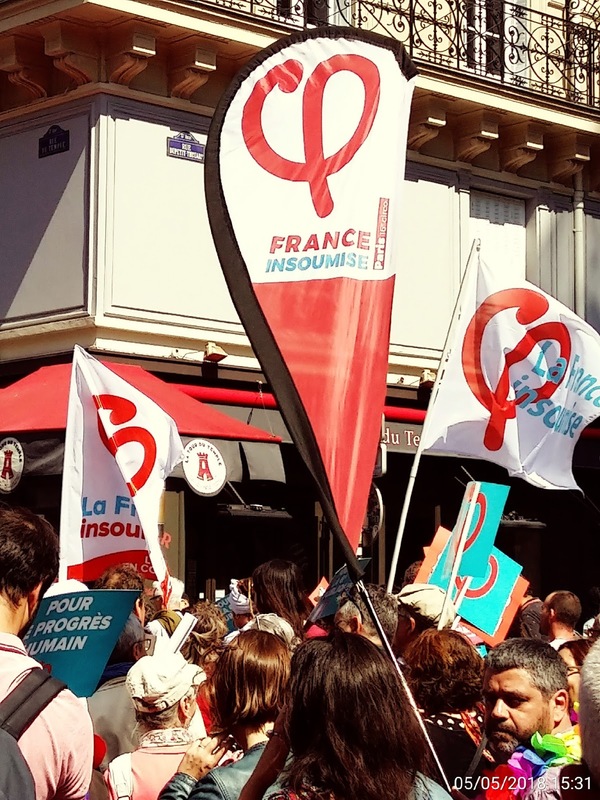 Even in the contingents of the New Anticapitalist Party and Ensemble, France Insoumise placards were common. The seven million votes last year and the 17 FI members of parliament who have been acting as tribunes of the movement have earned the legitimacy to bid to lead the movement. Opinion polls show that people consider the FI as the essential opposition. Other much smaller left organizations are having considerable difficulty taking this into account. 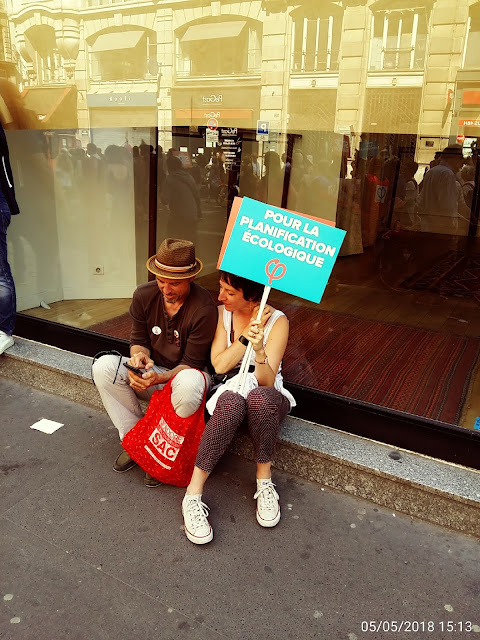 The FI had given out placards with the Phi sign and some of its main slogans. 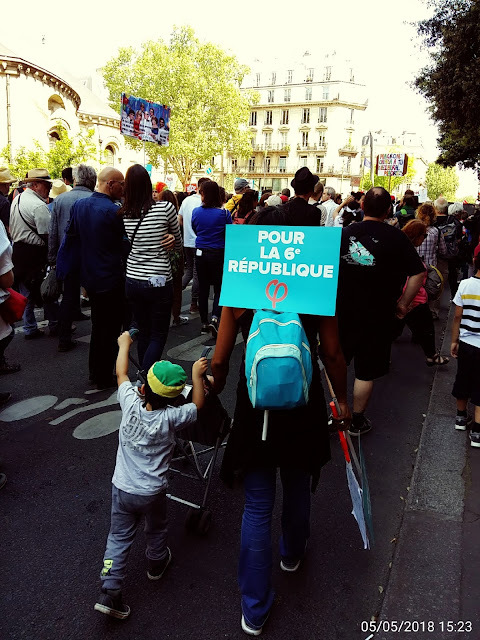 This one "For the sixth republic" is a demand for constitutional change, and a new constitution in which the president has far less power, and in which there are procedures to recall politicians between elections. This FI placard demands that France junk the European Union neoliberal treaties which impose privatization and austerity. This FI placard demands "green planning". The FI programme in particular calls for an end to nuclear power (which produces over half the electricity in France) and calls for 100% renewable energy, noting particularly that France makes practically no use of tidal energy. 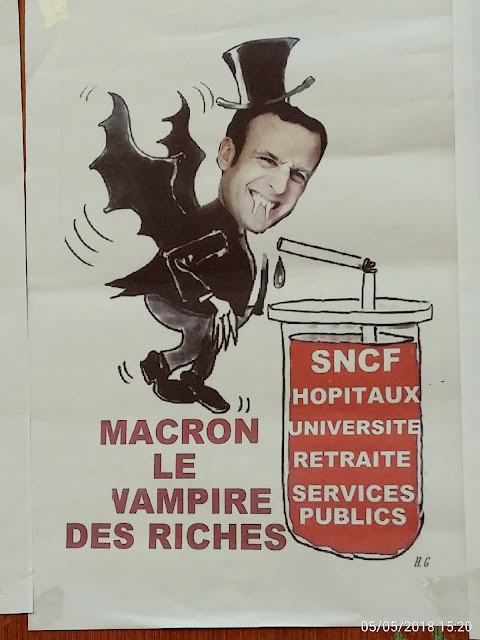 Here Macron is shown as a vampire drinking the blood of our public services. The sign of a popular demo is always the home made placards. Macron has openly said that his solution to the crisis is that France become a 'Start-up nation' where every individual feels they can set up their own business. 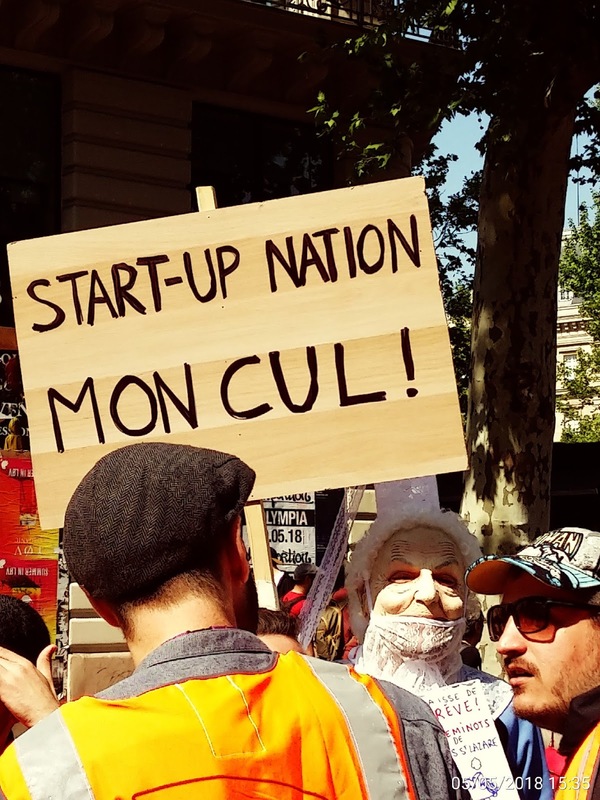 This railway striker's placard reads "start-up nation, my arse!". 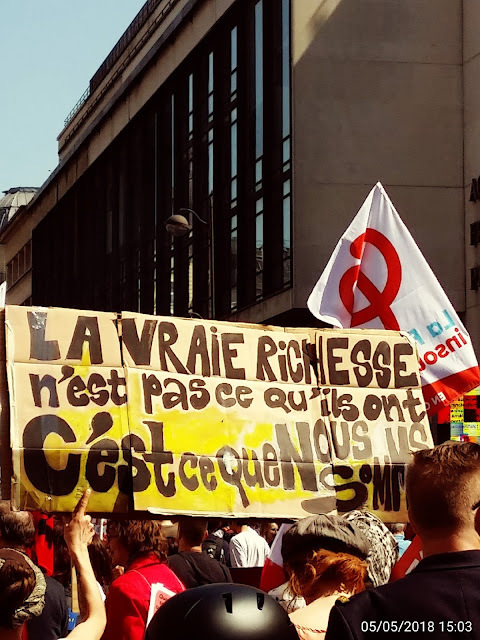 "When everything's been privatized, we'll be deprived of everything!" True riches is not what they have, it's what we are. 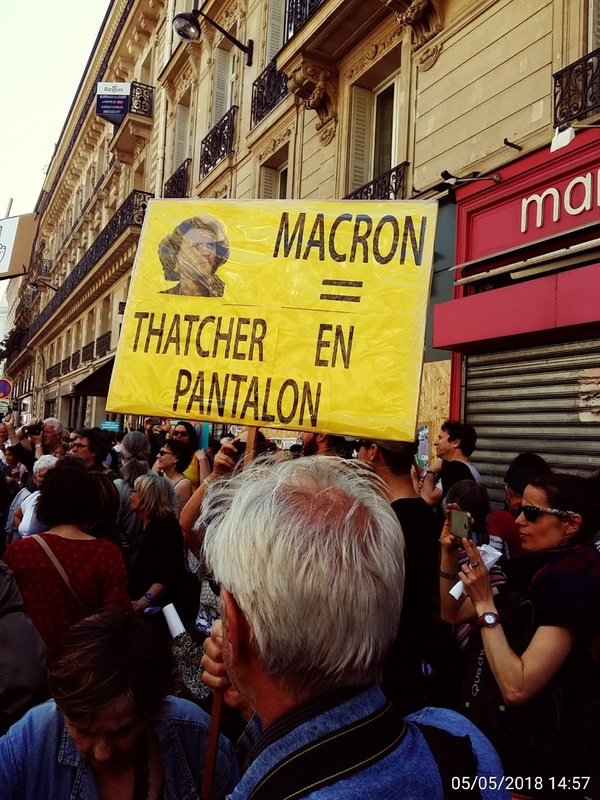 Macron is just Thatcher in trousers. "All our sympathy to the families of the shop windows." An ironic reference to the media storm this week after a McDonald's and a few shops were broken up by "Black Bloc" demonstrators on the first of May. 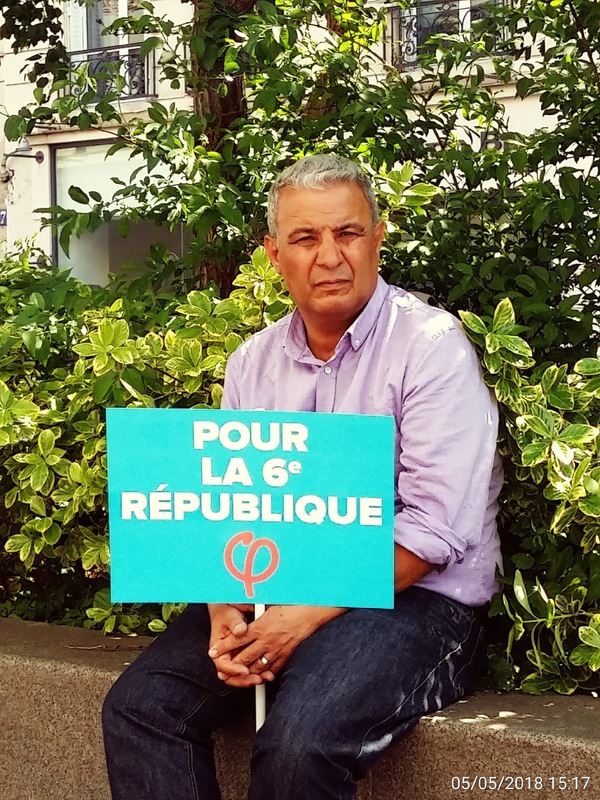 John Mullen is a lifelong revolutionary socialist living in the Paris area and is a supporter of the France Insoumise. Yellow Vests, Act Four: where is France going? Revolt in France: could Macron be under threat?